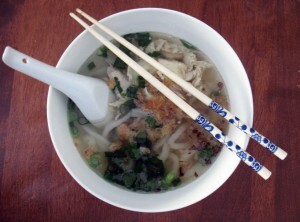 Khao Piak Sen is the Lao version of homemade chicken noodle soup. Literally meaning wet rice strands, this dish is made of slightly chewy noodles and a simple chicken broth. Khao Piak Sen is the ultimate comfort food, perfect for the cold weather, a sick day, or just when a warm, hearty meal is desired. Cut up chicken into quarters and place in large stock pot. Add water and other ingredients. Simmer for several hours, occasionally skimming off the foam that comes to the surface. When chicken is cooked, remove and allow to cook. Shred with a fork once cool enough to handle. Set aside for garnish. Slowly add water to mixture and stir. The key to a successful noodle is boiling water (not just hot). Start with a small amount of water, and continue to add more until a lumpy dough forms. 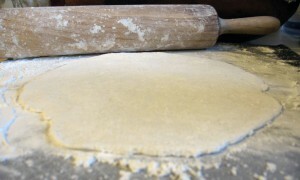 Dust remaining tapioca starch on a flat surface and carefully kneed the dough for several minutes. Dust a rolling pin. Break the dough into smaller balls, and roll them out to about 1/8 inch thickness. 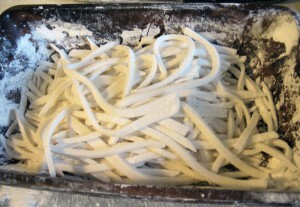 Cut into 1/4 inch noodles. 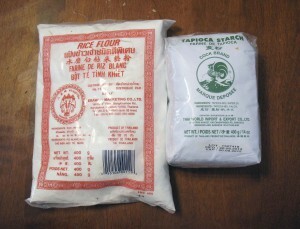 Dust the noodles with tapioca starch to prevent them from sticking to each other. The noodles can be cooked directly in boiling chicken broth. Doing so will cause the tapioca starch to thicken the soup. Alternatively, the noodles can be cooked in a pot of boiling water, strained, and then placed in individual bowls. Chicken broth is ladled over the noodles. Donna Luangmany is a Canadian-Laotian mama living in Windsor, Ontario. She contributes to CleanBirth.org as a social media advisor.